The former ‘homelands’ of Ciskei, Transkei, and others up north were hollowed out by the colonial and then apartheid laws that all but forced working age men to become migrant labour for the mines – with women following shortly thereafter – and the lack of rural investment and the necessity of wages has further decimated these areas during the two decades of democracy. Thousand of people leave the Eastern Cape every year too seek work or schooling in the cities and towns of the Western Cape, to succeed or suffer on the crowded margins. But the ancestors are strong. They won’t let their descendants be lost to the mirage of urban bling, pulling them back to the hearth for rituals, funerals and celebrations. Pulling back their money too, in the form of remittances to aged or sick relatives. This is the background to Thembela Madliki’s new play Where She Walked, which adds the element of rapacious developers wanting to snap up land in the old ‘Kei so they can build holiday cottages at the beach for the middle classes who will be easily able access them from the new N2 Wild Coast toll road. Inspired by Zakes Mda’s Heart of Redness, Thembela employs magical realism to tell the story of a young educated woman returning from the city to try get her ailing father to sell off the decrepit family rondavel and surrounding land. Will he or won’t he? 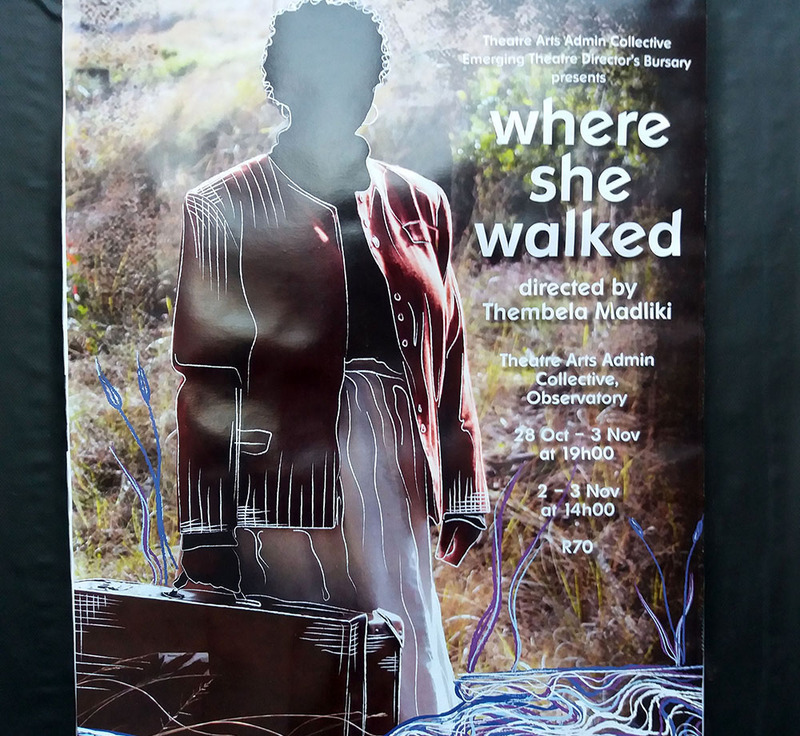 It’s the simplest of dramatic set ups, but Thembela reveals her directing skill in the way she weaves memory and mysticism into the fabric of her play. The exquisite use of silence and body language between her cast of three, together with evocative harmonising in song, seem to make it blur around the edges, as if we are watching a dream of our own. This is assisted by it being played in the round, a staging that seems to always add an edge of surreality to work, as well as the lighting design which illuminates scenes of the present and softens scenes of the past. Past and present segue into one another throughout the play, a technique that adds to the work’s dream-like quality, but beyond one or two moments, the shift between decades is clearly communicated through actor Thandolwethu Mzembe, who plays Sipho the father to Luthando (Indalo Bennet Stofile) and estranged husband to Zandile (Nthabeleng Jafta). Thandolwethu’s change of posture and subtle use of a beanie clue us to Nthabeleng’s role as his young wife, or the ancestral spirit who calls to Luthando in the winter storm. It is interesting that the story of Nongqawuse’s tragic millennial prophesy which resulted in famine after her visions of Xhosa warriors rising from the ocean to slay the British persuaded the Xhosa chiefs to slaughter the nation’s cattle in 1856 is contained in Mda’s novel. For elements within Where She Walked conjured thoughts of Nongqawuse without any direct reference. Just the girl, lost and indistinct on the darkened cliffs, suggests something of Luthando’s lineage and her father’s stubborn attachment to the land for which he has sacrificed much and gained little. And while it presents a subliminal key to this deceptively simple play, it also opens a door to the philosophical question of what, in this new digital world, keeps us attached to the land where so much of our blood has been spilled.